I experimented a bit with this Brusho background. I made it at the same time as this one and it started out looking very much the same. I wanted more muted colours so, while it was still wet with pools of colour all over the glossy cardstock, I spritzed with alcohol. It worked like magic! The alcohol repelled the water and I was left with this result. Brusho background on Glossy White cardstock, Rose Garden Thinlit. 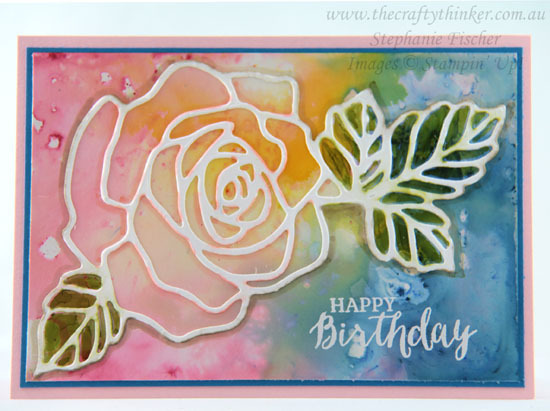 After I'd adhered the rose, I used Stampin' Blends alcohol markers to colour the leaves and add some shading around the rose. I wasn't very neat and there were little splodges of marker on the die cut so I attacked them with my Color Lifter. The poor thing was working overtime and couldn't remove all the colour but it did blend it out and I rather like the result. I thought the completely white die cut looked a little stark and stiff against the loose background. The greeting is white heat embossed. I strongly suggest spritzing the alcohol in a well-ventilated area ... or, as I did, vacate the area for a while afterwards!